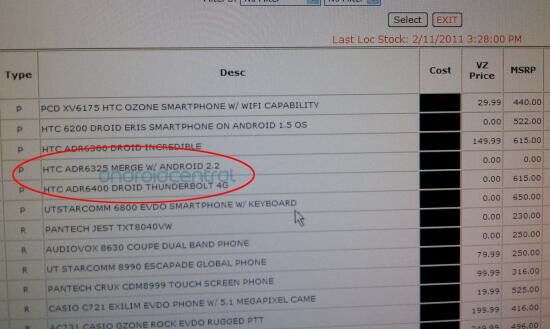 You are not alone if you are beginning to wonder if the HTC Merge will ever become a reality, but a screenshot of Verizon’s inventory system shows the Android-powered smartphone is still a possibility. The HTC Merge has produced more questions than anybody seems to have answers to over the last couple of months. We have all seen the specs, we have all seen photos and videos, but what we haven’t seen is a release date or any indication that this phone is actually real. 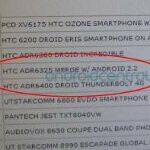 The posted image is of a screenshot from Verizon’s inventory system that clearly shows the HTC Merge with its model number ADR6325. Now there is a chance that this phone is a placeholder or that this could have been there for a while now. You can clearly see that there is no MSRP or VZ pricing listed. Underneath the HTC Merge’s listing is the upcoming HTC Thunderbolt which also has no VZ pricing, but does show an MSRP price of $615. So is this phone ever going to go mainstream? Tell us what you think in the comments below. Not sure phonearena...not sure...the merge would be cool for people who want a nice htc g2 with the keyboard thing on verizon...possibly with 4g? but i don't think so.....i want my thunderbolt but not sure what to do...if it comes out tommorow at bestbuy....which they some said there was a delay yet others say come get it...its 750 and eventually i could do a price check to get some money back but if not i might as well get it at vzw. They should bump up the specs on the merge before they release it. Yeah, it sounded pretty good last year when it first surfaced but now i'm not so sure how it will compare with whats to come. They sat on this thing because they wanted the hype to focus on the iPhone. Kind of dumb because this phone could be great for a world traveller. I could use an Android device like that. I don't want a Crackberry or carry 2 different iPhones (ATT/Verizon) just to travel overseas.